Plus, the other taxes your state will add on. Paying taxes on everything – from groceries to new clothing to gasoline – is expected. The latter, called the federal gasoline excise tax, began in 1933 at just 1 cent per gallon. It has since been raised 10 times to its current amount of 18.3 cents per gallon for gasoline (and 24.3 cents per gallon for diesel). 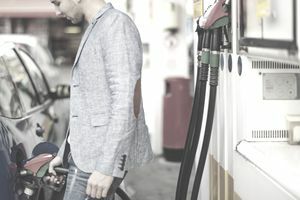 Included in the federal gasoline excise tax is a 0.1 cent per gallon Leaking Underground Storage Tank (LUST) fee, which is added to both the tax/gallon on gasoline and diesel fuel. Confused about the LUST add-on? Basically, it’s a trust fund created in 1986 and intended to prevent petroleum leaks from federally regulated storage tanks underground, as well as oversee or enforce cleanup of petroleum leaks, pay for cleanup when the responsible party isn’t known, and even conduct inspections. Last fiscal year, the LUST fund collected $92 million. What Do Federal Gas Taxes Pay For? Federal gas taxes are put into the Highway Trust Fund, which experts estimate will have $41 billion in revenue last fiscal year. These gasoline excise taxes are then used to pay for transportation-related infrastructure projects, as well as mass transportation costs across the U.S. Another interesting fact? The federal gas tax has not been raised since 1993 and has not been adjusted for inflation. This has been a point of contention amongst many groups for years. According to the American Society of Civil Engineers, one out of every five miles of highway pavement is in poor condition. Raising the national gas excise tax could help alleviate some of these issues, experts say. What Are the State Taxes on Gas? But the federal gasoline excise tax isn’t the only taxes you’ll pay on your gas. In fact, each state tacks its own tax onto every gallon of gas sold. According to information from the U.S. Energy Information Administration (EIA), the states with the highest gas taxes are Pennsylvania, 58.7 cents/gallon; California, 49.8 cents/gallon; and Washington, 49.5 cents/gallon. The states with the lowest state gas taxes are Alaska, 8.9 cents/gallon; Virginia, 16.8 cents/gallon; and Missouri, 17.3 cents/gallon. The map below breaks downs gas tax by state. Hover over each state to see the total. You can download a complete state by state spreadsheet from the EIA in the source link below. The average state gasoline tax as of August 2018 was 28.6 cents/gallon, the same data showed. State gas taxes help fund things like road repair, road construction, and necessary maintenance. The price of gas is affected by crude oil prices, as well as the cost of distributing and marketing. World politics can also play a part in the rise and fall of gas prices, as can supply and demand. Is the cost of gas hitting your wallet hard? If the cost of gas is wrecking your monthly budget, whether due to a long commute or travel-heavy job, consider saving on fuel costs by taking public transportation, combining trips, such as running errands on your way home from work, or taking an Uber on the weekends. Carpooling with coworkers is also an excellent way to save cash. Another bonus? It will save you that rush hour headache. You can also cut back on the time you spend warming up your car to save gas. Driving more slowly and steadily can also save you some fuel, as can avoiding excessive braking. Idling, such as when waiting to pick someone up or sitting in a parking lot, is another major gas-waster. Also, you may have heard that using your air conditioning uses up gas. While this is true, so does having a window open, as the wind resistance increases drag and can use more gas. Using your air conditioner's fan setting is your best bet. Keeping your tires and engine in good condition can also save you money on gas. If you simply can’t avoid that long road trip, try using apps that help you save money on gas by helping you find the cheapest gas near you, and rewarding you with loyalty points and other rewards when you use the app. In the end, both the federal gasoline excise tax and states’ add-ons speak to the old saying: Nothing in life is certain, except death and, er, gas taxes.